This image (approx. 9 Km - such as about 5,589 miles - across), taken by the NASA - MESSENGER Spacecraft on July, 19, 2014, features the Eastern Edge and Rim of a Simple Unnamed Impact Crater located in the Northern Smooth Plains of Mercury. Superimposed, on the Inner Eastern Wall of this Unnamed Impact Crater, there is another oblong-shaped Unnamed Impact Crater. The smaller oblong-shaped Impact Crater is elliptical because, most likely, it formed on a Slope of the larger Crater's Wall, after a very oblique descent (---> fall). It also appears that this (Always relatively speaking) small Impact Event, caused some Material (Dust and small Rocks, maybe?) 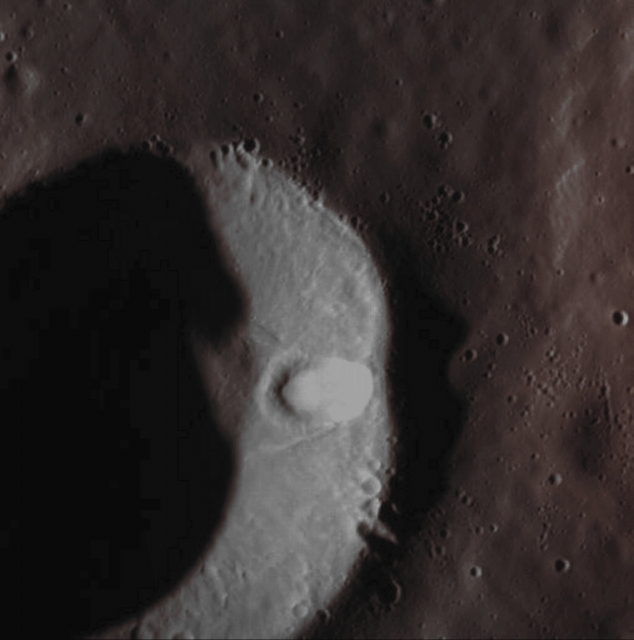 to slide down the bigger Crater's Inner Wall, which can be seen in this High-Resolution Image. Other (and even smaller) Impact Craters (or, maybe, evidence of the passing of Ejecta) can easily be spotted on the very Edge of the Eastern Rim of the larger Impact Crater. This picture (which is an Original NASA - MESSENGER Spacecraft's b/w and NON Map-Projected image published on the NASA - Planetary Photojournal with the ID n. PIA 18692) has been additionally processed, contrast enhanced, Gamma corrected, magnified to aid the visibility of the details and then colorized in Absolute Natural Colors (such as the colors that a human eye would actually perceive if someone were onboard the NASA - MESSENGER Spacecraft and then looked outside, towards the Surface of Mercury), by using an original technique created - and, in time, dramatically improved - by the Lunar Explorer Italia Team. Different colors, as well as different shades of the same color, mean, among other things, the existence of different Elements (Minerals) present on the Surface of Mercury, each having a different Albedo (---> Reflectivity) and Chemical Composition.